How Much Did The WoF Video Puzzle Board Cost? Exclusive documents uncovered by BuzzerBlog reveal how intricate the props you see on TV actually are. That Monday, the new puzzle board was introduced to the nation. It boasted 52 touch-activated monitors configured in four rows. The main advantage, production-wise, of the new puzzle board was the time advantage. With the old manual puzzle board, the letters had to be manually changed after each round. This meant stopping tape, having contestants look away from the board, loading in letters in their proper place, then starting tape again. With a computer-driven board, a new puzzle could be loaded in with just a click of a light pen. In an undated document discovered by BuzzerBlog, Bill Monk, Electronics Supervisor at CBS, explained in full detail how the puzzle board works. 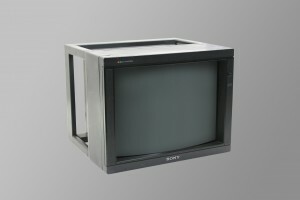 Each monitor on the puzzle board was a Sony PVM-2030 CRT monitor, placed on its side. Each monitor’s magnetic field was modified to minimize color impurities, which is how each monitor maintained matching color fidelity. The frame around each monitor contained a flat membrane switch, which were routed into a keyboard encoder which the computer then read. So basically, with the right software, Vanna could use the puzzle board to play Doom or something. The entire puzzle board was controlled by one Pentium computer. 5 days’ worth of puzzles (sixty in all) were loaded into the computer via a re-writeable laser disk (they probably used the Pioneer VDR-V1000). The producer let the electronic team know what group of puzzles got loaded into the memory first. Initially, each monitor was loaded with the green static image which held the show’s logo. It also maintained the visual continuity of the previous puzzle board, which had green sequins on one side of each trilon, indicating the block was unused in the puzzle. The computer’s display was a monitor hooked up with a light-pen. A light-pen allowed precise, quick input; faster than a mouse, easier than a keyboard and more precise (and at the time, more feasible) than using a finger. As a contestant calls out a letter, using a light pen we touch the appropriate letter (all the letters are displayed across the top of the computer display) and via the router if the letter is in the puzzle we turn the appropriate monitor(s) blue and trigger a sound effect for each correct letter. As Vanna touches the switch on the monitor a code is sent back to the computer if the computer determines that the switch pressed coincides with a “blue monitor” we display the chosen letter to the monitor and so on until all the “blue monitors” have been touched and letter displayed, finally we turn that letter off on the used letterboard. The computer also controlled the chaser lights around the board, and the used letter board as well. A second program, controlled also by light pen but using a different computer, controlled, computed and displayed the players’ scores. 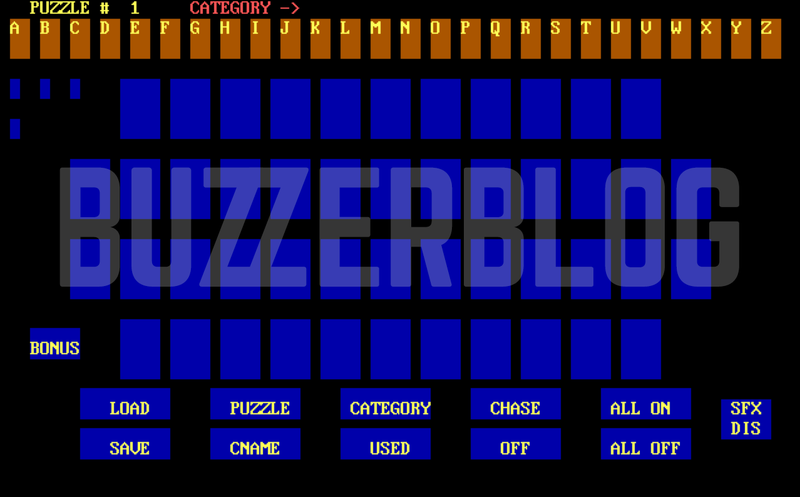 This is a screenshot of the software, unearthed by BuzzerBlog, of the software used to control the old Wheel of Fortune puzzle board, and we don’t think it ran the video puzzle board. This software was created in 1995. Well, how much did it cost? In another unearthed document discovered by BuzzerBlog, a heck of a lot. Between the video frame holds that run the monitors, which cost upwards of $70,000 in total, the $43,000 video router to run all 52 monitors, the $11,000 laser disk writer, $2,000 worth of road cases to store everything, the game computer, graphics generators, spare parts for repair, tax and over 900 hours of labor, the board is estimated to cost $241,406.92. According to a different memo sent to Wheel of Fortune producers Harry Friedman and Steve Schwartz, the cost didn’t include the 52 monitors. The monitors, according to an invoice in 1998 from the Department of Defense, cost about $1,300 each, which means that the monitors could have cost the show more than $67,000 in total. Totalling everything together, if you were planning on building a 1:1 replica of the first Wheel of Fortune puzzle board in your garage, expect to spend over $300,000 (or, $444,000 in 2015 dollars). The modern puzzle board is probably vastly more expensive, with more intricate lighting, flat panel monitors, and high-definition graphics, but it’s interesting to see exactly what parts made the board that we knew and loved for the better part of a decade move.